Hanging banners on buildings is a popular way of decorating a bland facade or hiding a messy stage of construction. But while the later is usually taken down after a couple of years, the former can be displayed for 5-10 years. This project promised the design would be displayed for 8-10 years, so yes I was very excited. During the info session with the developer and members of the Durham Arts Counsel, the artists were asked to create a design that was representative of culture, diversity, and history of the city and “please avoid cliches or making a continuous image.” Below is the design narrative for my submission. Downtown is a place to experience things. You park your car and walk down the street towards you favorite shop, or that new lunch place that just opened, or a small cozy bar for a date after a long week. I created the design to represent some of the things that downtown Durham has to offer. The images are meant to inspire the visitors and the locals to explore and experience the city. Different colors and patterns come together to form an identity, a sense of a place that combines rich culture and a fresh perspective. I took my inspiration for the color scheme from the historic buildings in the downtown area and elements that are strongly associated with the city, such as dark blue for the Duke University. The images work as a series, each one illustrates an activity. First one is titled “Learn” and is inspired by the close proximity of Duke campus and it’s student population. Second one is “Taste” - a humble nod to all the wonderful restaurants. Third is “Create” - a celebration of Durham’s rich artist community. Forth is “Dance” - whether in a club or in a park, durhamites know how to party. Fifth one is titled “Connect,” and it is perhaps the most important one, because relationships are the salt and sugar of life. The sixth is “Play” - a hopeful message to keep the children safe and let them play, and to keep playing ourselves, be silly, have fun. The seventh panel is “Music” for it connects us all, and experiencing it can be both intimate and empowering. And finally, “Work” is a simple scene that reminds us that as society moves forward we must be prepared to embrace the change and keep up the work of bettering our world through ideas and connections. I was selected to be one of the 5 finalists. The winning design was picked by the public. Imurj is a creative hub in Raleigh, equal parts an art gallery, a music venue and a bar, as well as a welcoming place for all sorts of creative events. I learned about them in 2017, they had just opened and were running a promotion for new members. I got to know the gallery manager Kenneth Proseus and we talked about murals and public art a lot. 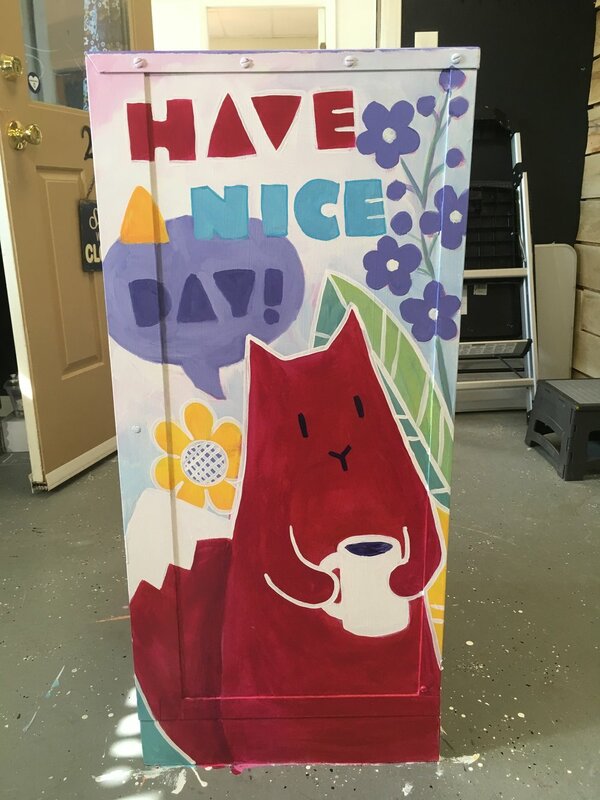 He wanted to do something in the shop area and the bathrooms, and I got the chance to leave my mark on both (the last image is of a fox painted on the wall in the shop area). The idea for the design came from thinking hard about all things calming and beautiful. Bathrooms are a bit like a sanctuary. If you are an introvert like me, bathroom is a place to escape the pressure of public attention and our own anxiety. It is also a pace to do a reality check, that’s why when women come in there the first thing they are gonna do is look in the mirror - their most honest friend. Got spinach in your teeth? Yep, the mirror will tell you. But after the woman has thus confronted reality, she needs something to boost her confidence and put things in perspective. I thought about painting actual people, and lots of words, or maybe even going for complete abstract. But then I thought “what would make me feel relaxed and encouraged, and would take me out of my head for a moment?” I find nature very relaxing. I love sunsets. I’ll stop everything I am doing to watch one, because when I do all the worries disappear. It’s a perfect moment of presence. The blooming tree is a symbol for beautiful transformation, the modest looking buds open to reveal stunning beauty inside. I hope that when the ladies look at the mural they think of all the beautiful things they deserve in life and walk out with their head held high. This was a fun project, a true street art opportunity as I like to think about it. The newspaper boxes are an iconic part of the urban landscape in US. Their grungy stickered up frames pop up in many cinematic street scenes, and are scattered across Raleigh like rusty remnants of some square bodied alien invasion. I’ve always wondered at the potential of these boxes to become little street art gems, so when the Walter Magazine got in touch about the project I jumped right on it. They told me the box would be placed next to the Dock 5013, which is “a creative community for makers, entrepreneurs, artisans, retailers and forward thinkers.” I started thinking what kind of interactions would people there have with the box, and what kind of messages would be inspirational to them. 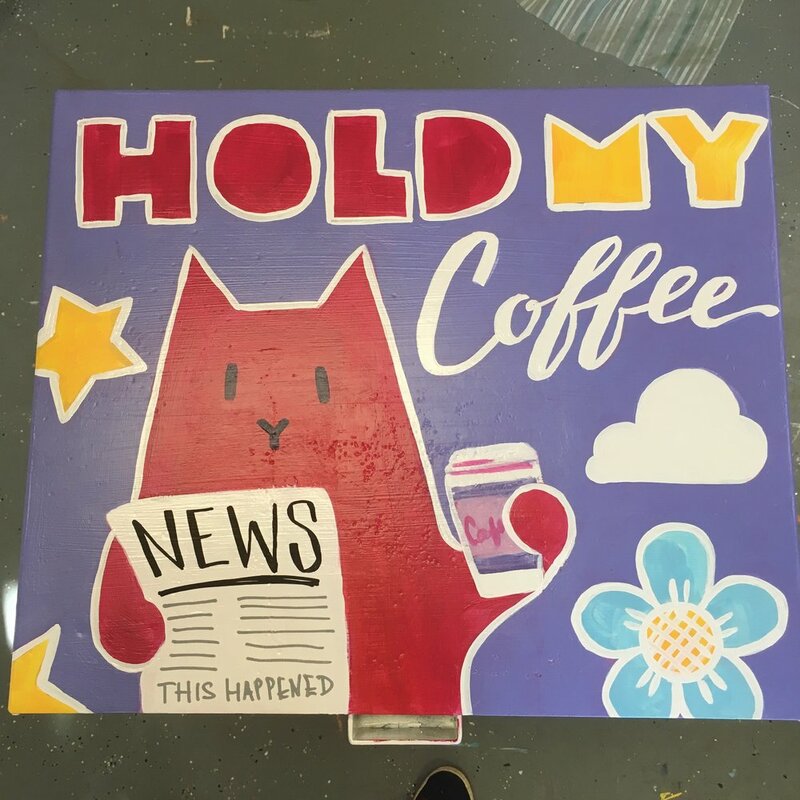 There are four “active sides” (the back is facing the wall), and if I had to pick a favorite it would be the top - “hold my coffee.” What’s yours? 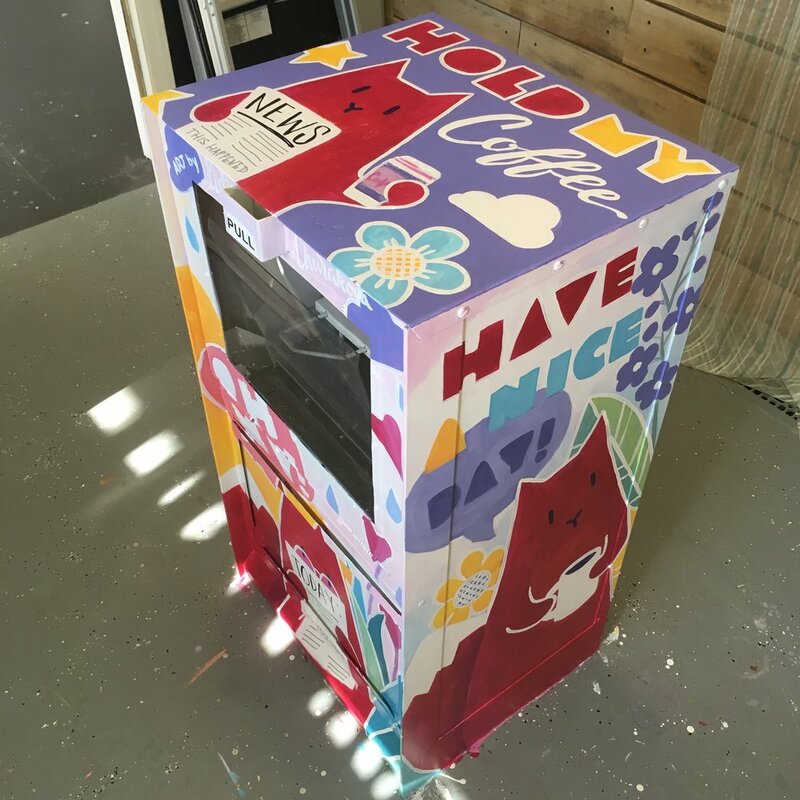 Look for the rest of the boxes all over the downtown in Raleigh, and don’t forget to tag the artists and Walter Magazine to inspire more awesome public art projects on our streets! City of Raleigh commissioned sidewalk murals to decorate the two bicycle parking areas along the street. The design encourages people to use alternative means of transportation and appreciate the outdoor environment. The two parts were painted separately, couple of months apart because the city regulations for each side were different. I used the special asphalt-marking type paint, which is thicker and chalkier than usual wall grade acrylic paint. East side bicycle parking area is twice as big as the west side one and the bike racks were already installed. The big red flower in the middle is the focal point that ties the mural with the racks. I had to modify parts of my design sketch to work with the terrain, if you will. I don't know how this happened, but somewhere in the city planning process the storm drains slipped through the cracks, because there is not nearly enough of them. The ever so kind Mr. Chavis form the city's transportation department had to torch the pavement to dry it out, even though the temperature was up in the 90s and there was no rain for a couple of days. I had to paint quickly before the water moved back in and made the paint run. Working around puddles did teach me that a little water in the paint was a good trick to get it in the cracks. Outlines took two days, and then I missed one day and had to finish all of the color in one day, because the next day was July 4th. You are welcome Raleigh : ) The last day was pretty brutal, the air was hot, the pavement - broiling. I made the mistake of siting down on it in the evening so my back could rest, and after a couple of minutes decided that the back pain was preferable. Despite the discomfort, it was exciting and rewarding to hear all the compliments and shout-outs from the people passing by. My supervisor Todd came by and watched the paint while I treated myself to some cold water, snacks, and a bathroom break. People took pictures, kids watched me paint, busy adults took time to appreciate their surroundings - makes it all worth while. The west side design was the one that won me the commission. It took two days to paint in spring, a tight timeframe because of the ever changing North Carolina weather. The day before it was freezing, the day after raining. 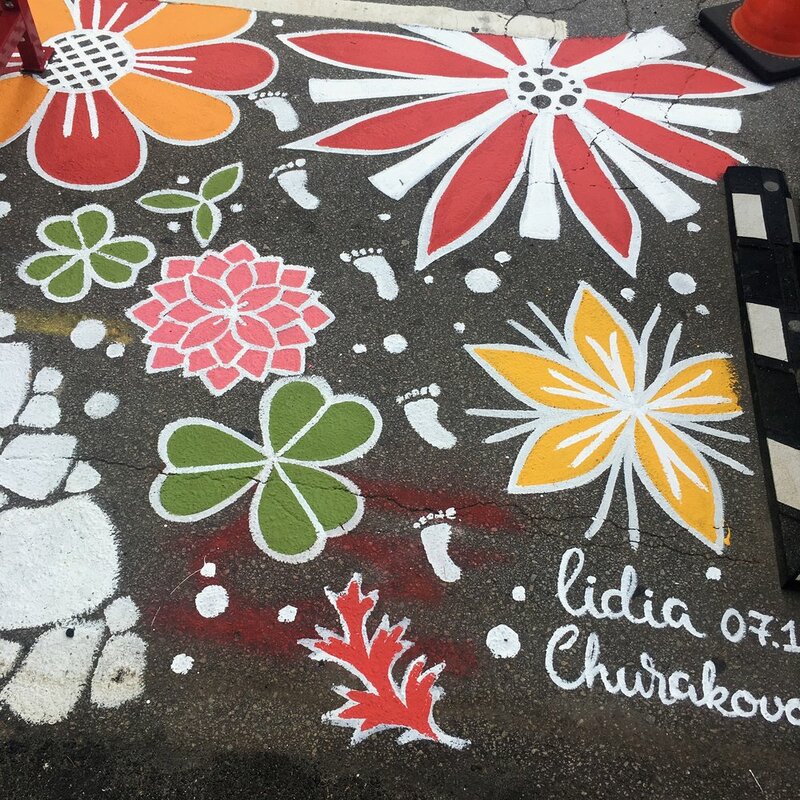 I helped to paint the sidewalks on Glenwood South a couple of years ago, but this was my first experience painting in the middle of downtown. I was surprised by the amount of people that stoped to pay a compliment, or ask a couple fo questions. One young man spent the entire day talking to me, and oh boy, he had quite a story to tell! But I was glad for the company, it was almost like listening to a romantic drama audio book. I don't know how much of it was actually true, I was just enjoying the experience. PSB mural was created in 2015. I was working with Scott Nurkin from Mural shop at the time, I was responsible for the design and then we painted it together. The mural was sponsored by PBR, hence the general concept, and the polygonal style was requested by Jeff Clarke, one of the owners. 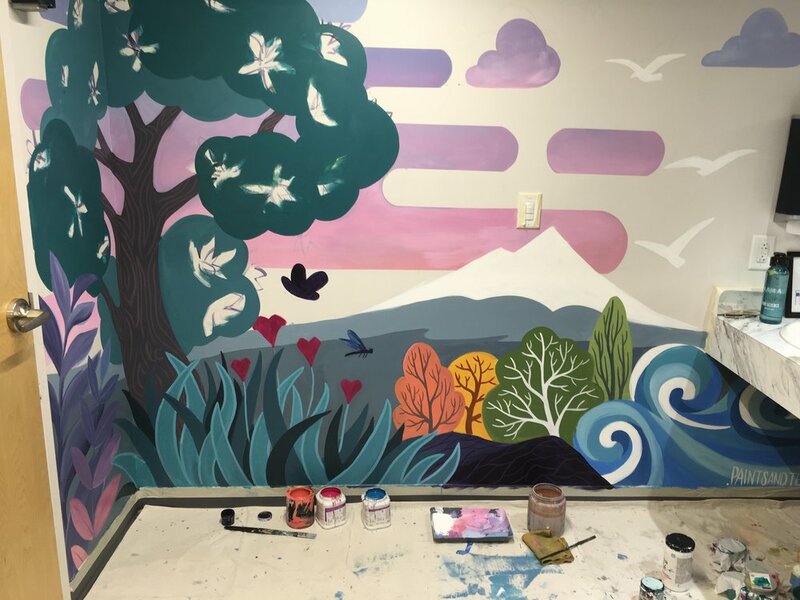 It was a very fun project that taught me a lot of essential mural skills. For example, all the lines were painted freehand, proving that at the end of the day your best tool is a steady arm.